If you’re reading this, most likely it is on a digital screen. Viewing information on a screen has become a normal part of life. However, it is important to consider how this affects the eyes, as they are one of our most important organs. In March, UF Health joins the American Optometric Association in observance of National Save Your Vision Month, an annual campaign to increase awareness about eye health. This year, the AOA will focus on blue light and how it affects vision health. Light comes in different wavelengths and energies on a spectrum, both visible and nonvisible. Visible light appears on the color spectrum, from red to violet. Blue and violet light has a shorter wavelength and lots of energy. It is because of this energy that exposure over time can have an effect on the eyes. Over the years, as people view more information through digital media, this has caused an increase in exposure to blue light, which studies have shown negatively affects vision. On average, Americans spend seven hours a day looking at the screens of digital devices, and millennials spend even more time than that. The effect of this increased exposure to blue light is Digital Eye Strain, also called Computer Vision Syndrome, or CVS. Symptoms of CVS include sore and dry eyes, blurred vision, headaches, and neck and shoulder pain. In addition to CVS, prolonged exposure to blue light can affect sleep quality. Evidence shows that blue light can impact the circadian rhythms that control the sleep cycle and can increase the time it takes to fall asleep. 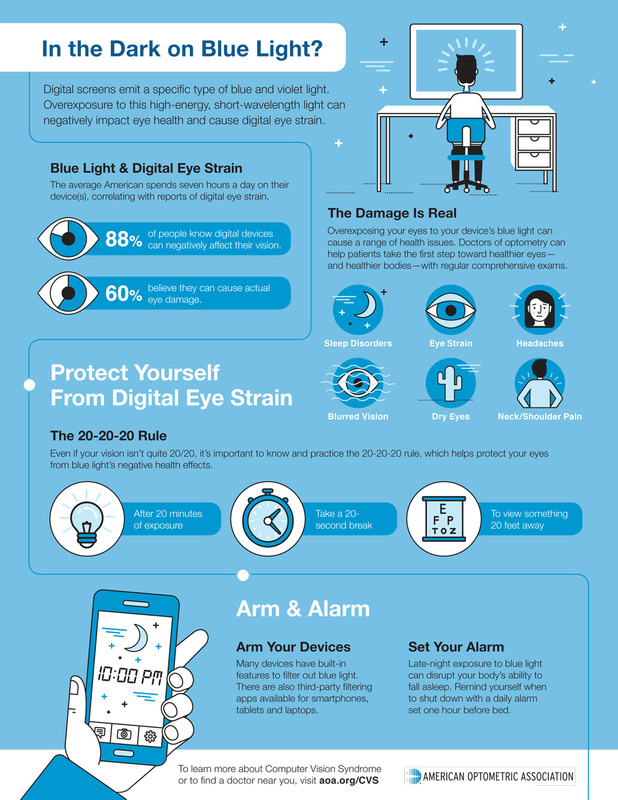 To reduce the potential for eye strain, and to help get a good night’s sleep, here are some best practices for digital screen usage. Keep the screen at a comfortable reading distance and angle. Computers should be viewed from 20-28 inches away and slightly below eye level. Make sure to keep the head, back, and shoulders in good posture and don’t hunch forward. For handheld devices, use the zoom function rather than moving it closer to the eyes. For prolonged use of digital screens during work, follow the 20-20-20 Rule. After 20 minutes of screen exposure, take a break for 20 seconds to view something 20 feet away. This relaxes the eye muscles and can help alleviate eye strain. When using digital devices at night, remember to “Arm and Alarm.” Arm digital devices with blue light filters. Many come with built-in settings and features for this purpose. There are also third-party filtering apps for smartphones tablets and computers. F.lux and Twilight are two apps available for download. Set an alarm one hour before you go to bed as a reminder to power down. Powering down may be difficult for many, but it will help the body prepare for sleep. Blue light is just one of many issues that can cause preventable vision problems; diseases like macular degeneration, cataracts, and corneal ulcers can all be prevented or delayed. Sonal Tuli, M.D., M.Ed., chair of the UF College of Medicine’s department of ophthalmology, who treats these medical issues and more, has seen them cause patients to lose their ability to read, drive, and see their loved ones. However, this loss of independence can be prevented by receiving medical treatment at the right time. The American Academy of Ophthalmology recommends receiving a complete medical eye exam by an ophthalmologist by age 40, and then as frequently as needed after that. If someone is diagnosed with a vision disease, Tuli says that following the doctor’s orders is important to maintaining healthy eyes. “Compliance with the treatment is the problem as patients don’t realize they are losing vision until it is too late,’’ she says. “That’s why is it so important to have regular eye exams to prevent a disease process from going unnoticed,” says Cameron. The physicians at UF Health Eye Center – Hampton Oaks can help save vision and improve overall health. Schedule your annual eye exam at the UF Health Eye Center – Medical Plaza.